This is the main access page to the account. Most prominent is the calendar consisting of a three-month view. 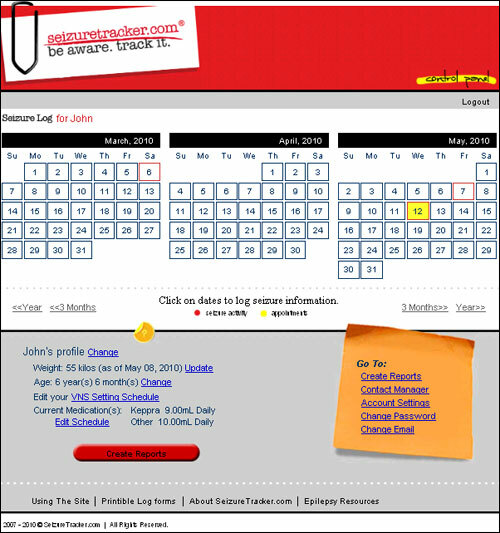 Each day on the calendar links to the corresponding event logging page. The outline and interior color of each day's box changes as events are logged or appointments are scheduled. A red outline indicates events logged for that day and a yellow interior indicates appointments scheduled. 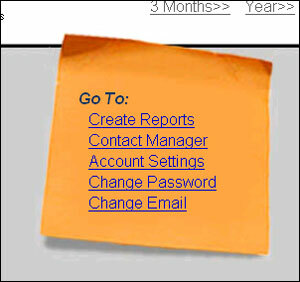 The user can scroll adjacent months by three-month increment or by a year by using the arrows located below calendar. 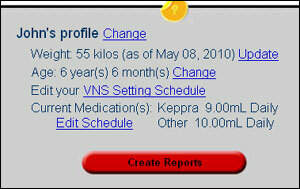 In the lower left side of the Control Panel page is a short profile including; weight, age, and active medications (if scheduled by user), along with a link to the VNS setting schedule (if active) and the create reports pages. You can also edit the "Region of residence when diagnosed" and "Cause of Epilepsy" selection by clicking on the "change" profile link. Also on the control panel page are links to the Create Reports, Contact Manager, Change Email, Account Settings, Change Password, Support Documents, and the About SeizureTracker.com pages.